Can Videos Really Help You Make Money? You may have seen cool, funny or interesting videos on YouTube or Facebook. It may have crossed your mind that these videos are great, but do they really make their creators money? 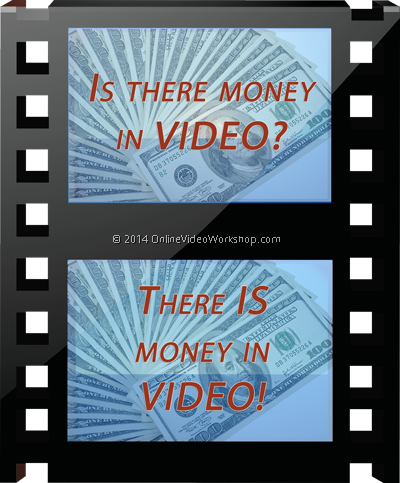 Can you really make money with videos? You may be surprised to find out how much money people are actually making with their videos. Here are some of the coolest ways to profit from your creativity! YouTube has an option where you can monetize your videos using an Adsense account. Over a billion people visit YouTube each month. They make over 4 billion dollars in ad revenue each year from those billion visitors per month. YouTube allows you to get a piece of this action by placing their ads on your videos and they pay you for any clicks you get on the ads on your videos. To enable this, you will need to register with Google as a YouTube partner. Once you have signed up, all you have to do is create and upload interesting videos to your channel with a short description that includes keywords that people who might like your video would be looking for. Ads will be overlaid on your video and to the right of the player on the video viewing page. Since YouTube has a pretty good idea of the demographics of their audience, they place ads that are a fit for the audience and your video content (providing your description and tags are accurate). Whenever someone clicks on the ads while watching your video, a certain portion of revenue is credited to your account. Ad revenue on YouTube varies by subject matter and how much someone is paying for the clicks. Some amounts are pennies while some are worth dollars, it is not a matter of making a lot per click, but getting a lot of clicks that build up into a large amount in your account! The more people watch your videos, the more your revenue will increase! The more popular you can get your videos, the better it is for your earnings. Viral videos must impact the right audience with creativity and boldness. The description and title are crucial to make people want to see the video and also to make people want to share it on social media. Other revenue sharing sites for your videos include Revver and Blip.tv and eefoof.com – more and more video revenue sharing sites are coming out, so this list is far from exhaustive. Affiliate marketing is a great way to make money with your videos as well! First, you want to join a few affiliate marketing networks like Clickbank, JVZoo and Amazon. You earn money by placing your affiliate links to a product next to your videos (usually in the description). Putting your videos on a separate page or on a blog post is a great way to ensure that people are clicking on your link rather than the YouTube ads. When people watch your videos, a few of them will click on your affiliate links and buy the product you are promoting. When someone purchases a product that you referred them to, you earn a percentage of the revenue. Using Blogger or your own WordPress blog, you can embed videos from YouTube or other video sharing sites related to a particular niche. You can use a combination of Adsense or affiliate links to earn revenue from your work. The cool part about this method is that you are earning revenue from the creativity of others. All you have to do is research the right niche and match up good products with the videos you are posting. Some sites are willing to pay for quality video content. The important distinction is that your videos must be of high quality and the content must be of high value. A 320 x 240 video of a kid hitting his dad in the family jewels with a wiffle ball bat will not get you anything, but professional looking videos of you demonstrating the proper way to swing a baseball bat would probably be accepted. A good example of such sites is iStockVideo.com and Pond5.com. They pay you royalties for people buying your videos and photos. They also have a referral network that pays you when someone you refer buys a video or photo. When you create professional videos with high value content that gets a lot of views from a specific demographic, corporate sponsors are often interested in paying you for ad placement within the video or in the description. Ads can be placed within the video or after it or as an overlay on the video. If you also become an affiliate of these companies, you can place a call to action after the video and earn commissions from any sales you make. Videos are great for branding your business and promoting your products. Like affiliate marketing, you use the videos to educate the prospective buyer and help make the sale. You can also use videos that are entertaining to the target audience of your business and use those videos to get people to your website – either through ads on your video or call to actions at the end or a link in the description. If you form partnerships with local business owners in your area, you can create some videos to market their products. If you concentrate on a particular field to make promotional videos for, you can find potential clients locally that are willing to pay you to create and post videos for them. 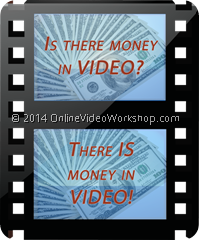 If you are willing to do the work, making money from videos is really possible! Without proper training and a willingness to put in the time to learn what to do and how to do it the right way, many will fail or will not even attempt it. To stand out from the rest of the video marketers, you have to come up with the right strategy. Don’t attempt to do all of the suggestions above, but rather choose the ones you can put to use immediately and then use your earnings from the first to work your way into more methods. Unless you create the next YouTube, don’t expect to earn billions overnight. Start building income streams, one at a time, until you have money coming in. Then expand.